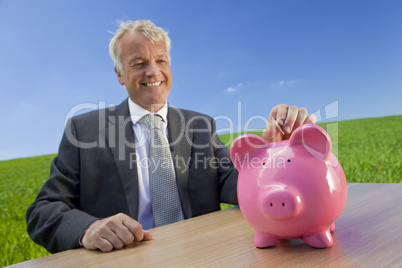 Description: Green investment concept shot of a middle aged man putting a coin into a big pink piggy bank in a green field with a bright blue sky. Shot on location with the focus on the piggy bank in the foreground. Royalty free photo Man Making Green Investment with a maximum resolution of 5616 x 3744 pixels. The image Man Making Green Investment is one of 23697 photos in the category Finanzen & Börse and has been part of ClipDealer's stock since 21 Oct 2009 11:51:44. Man Making Green Investment is released for Kommerzielle und redaktionelle Nutzung.